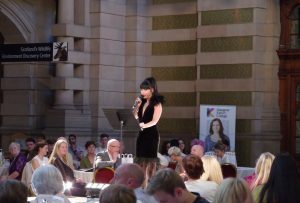 GKC Fashion are delighted to announce that the total raised this year for SAMH is £2,817. 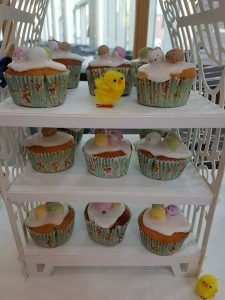 The department hosted a tea party which was attended by Chloe from the charity to receive the cheque. 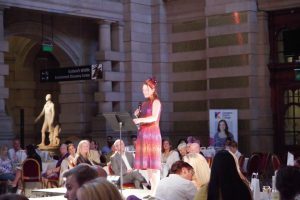 Glittering fashion show at Kelvingrove to mark 10 years of working with Nurnberg partners. 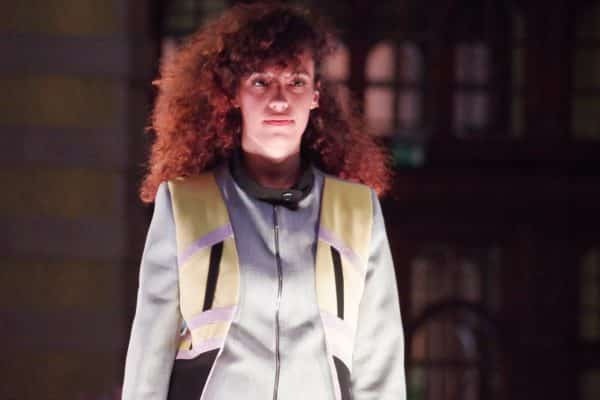 Fabulous student designs honour the 150yr legacy of Charles Rennie Mackintosh and Glasgow Style. 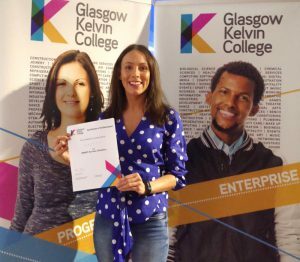 Glasgow Kelvin College and B5 Modeschulen Nurnberg are still celebrating their successful Erasmus+ partnership ten years on! 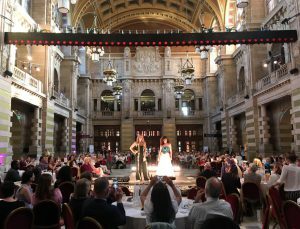 To mark the anniversary, both colleges teamed up to stage a fabulous fashion show of students’ work at Kelvingrove Art Gallery and Museum with the support of Glasgow City Council and Glasgow Life. Laura Boyd of STV compered the charity event ‘Fashion: Night At The Museum’ which raised funds for SAMH in recognition of Mental Health Awareness Week. 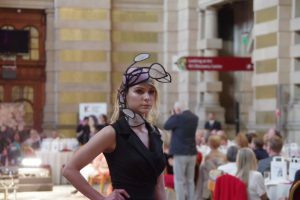 Lord Provost of Glasgow Eva Bolander, co-hosted the dazzling evening showcasing students’ exquisite designs inspired by Rennie Mackintosh and the Glasgow Style. 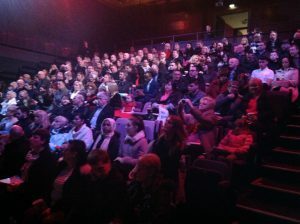 Guests of honour included the Mayor of Nurnberg, Dr Ulrich Maly, and his wife, Ms Petra Maly, a show Patron. 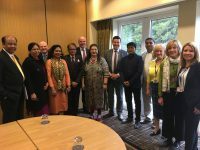 They were joined by other dignitaries including Ms Gisela Schlenk, Principal of B5 Modeschulen Nurnberg. 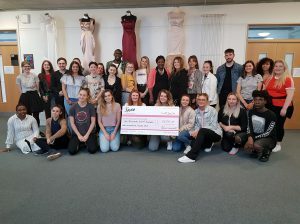 Fashion Design and Manufacture students from both colleges worked tirelessly to produce a dynamic catwalk collection, drawing on skills and talents gained during their exchange experiences. 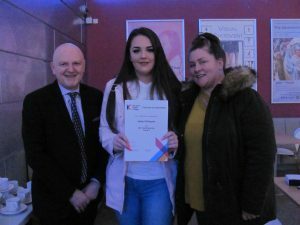 The show also featured work by Niamh Docherty of Our Lady’s High School in Motherwell who was crowned the Schools Competition winner. A contest to encourage promising, young designers. 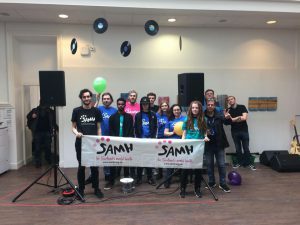 The show was a team effort with involvement from students across the college, representing a range of disciplines, including events management, hairstyling, make-up, photography, film and sound. 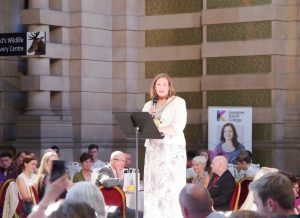 “We are honoured to welcome our guests to Glasgow and delighted that the hard work of students from Nurnberg and Glasgow is being recognised in this way. 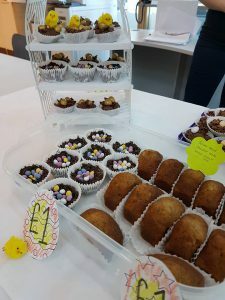 Our students have collaborated to showcase impressive flair and talent in these exceptional collections and it is wonderful that friends, family and colleagues are able to get a flavour of their skills. 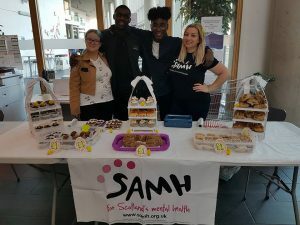 Thursday the 29th of March saw our Fashion students hold a fundraising bake sale, in the foyer of the Springburn campus, in aid of SAMH. 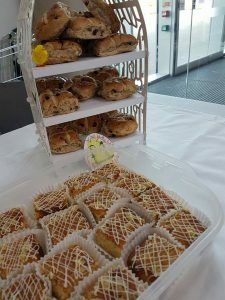 There were a variety of tasty treats on offer, all served with a smile. 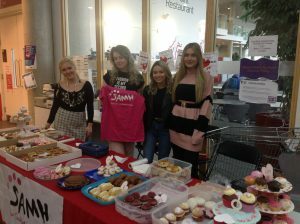 As usual this event proved to be popular with fellow students and staff members (who can resist a cake) and the day saw the team raise £180 for SAMH. 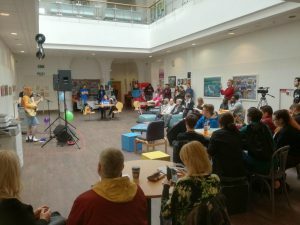 Our January start NQ music Business Events and TV team managed to raise nearly £100 in their first event. The KRT (Kelvin Recreations Team) curated this collaborative effort with support from Music Business, Events, Film & TV, Sound Production and the Art team. 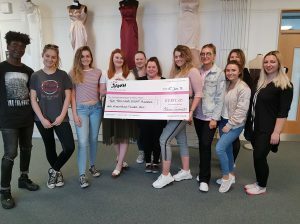 The students are raising additional money to be donated To SAMH along with the amount raised through the Fashion department. The team managed to sell a fair bit of old Electric Honey merchandise. Thanks to all involved who made this happen! We have a shorter blog update for you this week, but still have plenty to hold your interest. Let's start with the fantastic Prize Giving Ceremony. 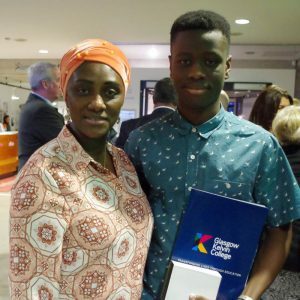 Thursday evening saw a packed auditorium at Platform cheer on our non-advanced prizewinning students from session 2016/17 as they received their well-deserved Awards. 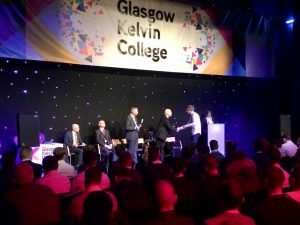 Proud family, friends, employers and a host of staff from the faculties were delighted to see around 95 of our amazing students get the praise and recognition they worked so hard for at Glasgow Kelvin. 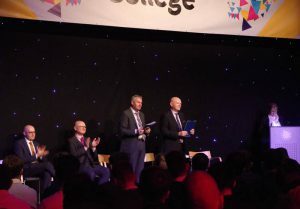 Thanks go to all the staff who supported our students during their studies and made it along to the ceremony to help make the evening that bit more special for them. Thanks also to the team who pulled the whole ceremony together and worked hard to make it a successful night for everyone concerned. 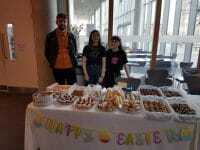 And congratulations, well done to the students themselves! Earlier this week, the College signed up to the UN SDG (Sustainable Development Goals) Accord as an expressed commitment to sustainable operations and the promotion of its Climate Change Action Plan. 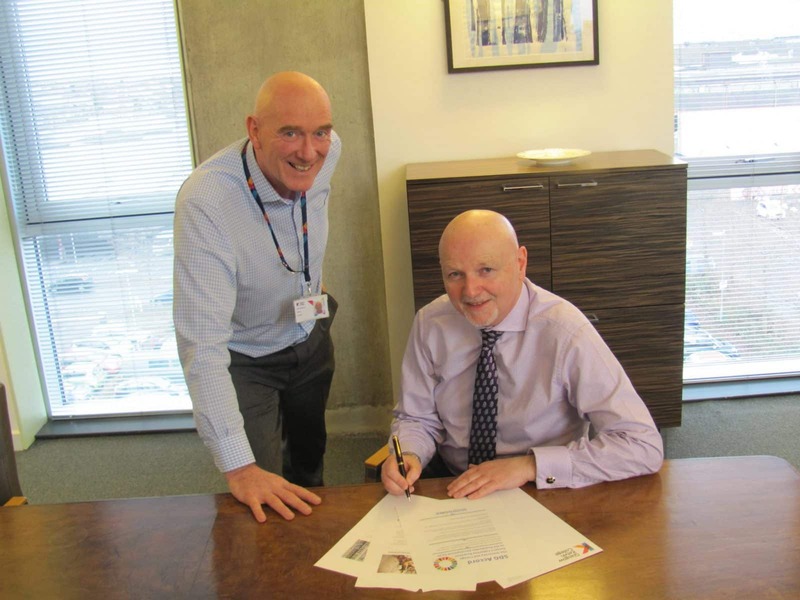 We are the third college in Scotland to sign up to this agreement to share educational innovation in the field of sustainability. Through EAUC, the College is now formally committed to the 17 goals as set out in the Accord. 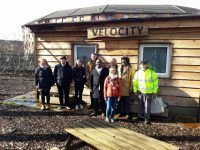 As a prelude to the opening of the GK Velocity Cycle Hub at Springburn on Friday of this week, the College is delighted to show its support of these international goals and to ally itself with other UK Colleges and Universities who have signed the Accord. Iain Gordon, Head of Estates, is pictured with Principal Alan Sherry. Look out for the new TV and cinema advert promoting the Ford Ecosport. A segment of it was shot outside the science labs at our East End Campus about two months ago, although it is cleverly disguised as a pet adoption centre. This six second segment involved a production crew of 50 along with 30 support vehicles and more than six hours on set. One of our HND film students, Chris Lynch, got a great opportunity to shadow the whole shoot, helping out and meeting producers, directors, camera operators and actors. Chris seized this chance to experience real behind the scenes filming and to make valuable industry contacts. It couldn’t have happened without the co-operation of staff and students at East End on that Friday afternoon - so thank you! Ahead of the Level 5 Professional Cookery students starting their assessments for the 'Working Safely' unit next week we welcomed Geoff Lawson, Health and Safety Manager to answer a number of questions on his college role. 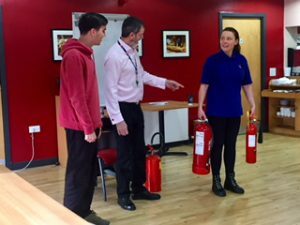 Geoff covered many topics, including being mindful of the fact that despite the Catering & Hospitality Industry generally being considered a hazardous environment to work in a lot of the job of keeping everyone safe is simply down to common sense; "If it doesn't look right, it probably isn't". 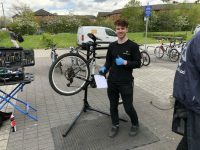 As well as in the workplace Geoff extended his knowledge of general day to day health and safety in homes and when out and about at the weekend. Let's face it when you enter a bar or nightclub on a Friday night or when you stay in a hotel room, how often is locating the fire escape one of the first things you do? You just never know it may just save your life. The Valentine Bake Sale was held in our Springburn Campus reception on Wednesday the 14th of February. Well done all, keep up the hard work. 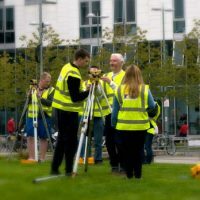 That's us finished for another week, but remember if you have anything you would like included, please email the detais to Tracey on tborland@glasgowkelvin.ac.uk and we will makes sure it goes in the next Blog update.